How do you spread a vision? So I have a request, how in your opinion, can a small band of passionate leaders in Christchurch create excitement and hope about rebuilding an iconic Christchurch? How can they get the community to take shared ownership when many are still caught up in the grind of survival? If you’ve ever been hit with personal loss, you know that dreaming again is a very good sign. 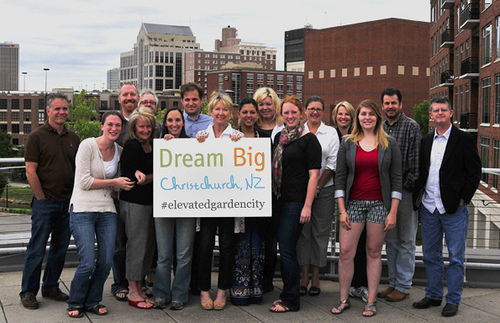 Let’s help the people of Christchurch dream BIG. Let’s show our support. Share this idea with your friends. Let’s start a conversation. Do you like the idea of an Elevated Garden City? Have you seen anything like it? Would you visit it? I am humbled at how connected my community and my world has become lately. Even if you just send a word of encouragement or retweet using the hashtag #elevatedgardencity, let’s toss some big time love out in the world on this Tuesday morning. Please take the time to check out Elevated Garden City, link to the Brains on Fire blog (below) or simply spread the word on Twitter. Thanks. via Brains On Fire Blog » Blog Archive » More thoughts on community, connections and being human..